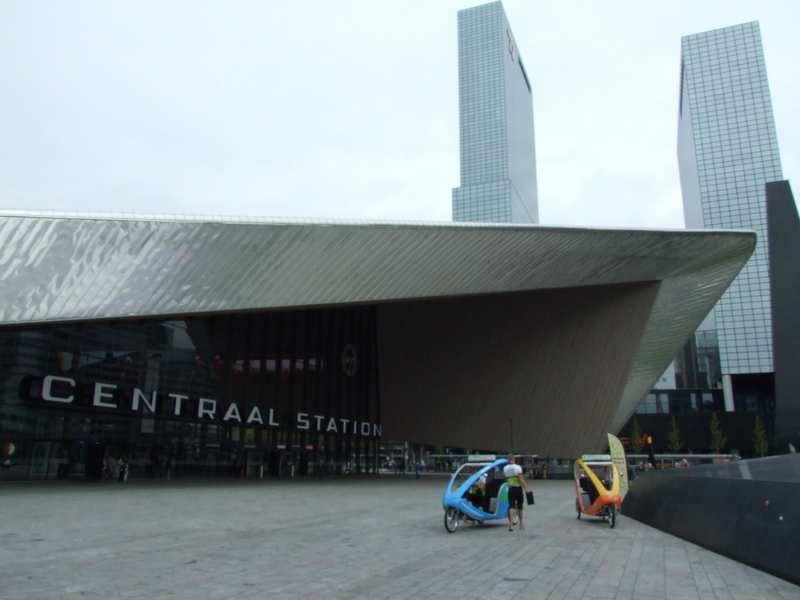 Yesterday I had to switch trains at Rotterdam Central Station. Rotterdam is one of the larger Dutch cities. Amsterdam was built around the present water routes and next to the “Amstel” river. “Amstelredamme” became Amsterdam over time. Rotterdam was built around and named after the river the “Rotte” and became the city Rotterdam. “Dam” literally means dam as in water work here. One way to control rivers and streams is to build dams and canals. When you read about the history of the Netherlands the battle for control over the land against the sea is one topic that always comes back. Since Medieval times the coastal and northern territories were always under threat by the water. Many names of cities, streets and infrastructure works have names that refer to water solutions directly or indirectly. In 1270 the dam at the Rotte was a fact. The region was already inhabited for centuries. Since the dam was placed the settlement Rotterdam was born and its natural harbour continued to grow. The Dutch coast has been a region for trade in north-west Europe for centuries. In 1340 Rotterdam was granted city rights to become a city. As Rotterdam developed through the centuries it acted as a water route stop between Amsterdam and Antwerp. After the 80-year war against Spain Rotterdam became more important as an independent city. Its location and natural harbour made Rotterdam more accessible than Amsterdam. Through the centuries the city grew in size. During the Second World War the old city centre was almost completely bombarded which the preceded the Dutch capitulation in 1940. In the 1950s the rebuild began. The resulting modern architecture is both unique and fascinating in the Netherlands. The central station made me regret I only have a 28mm wide-angle lens. It was a cloudy day, no blue skies. Website Gemeente Rotterdam – See “Wonen en Leven” and look for “Historie Rotterdam” in the overview. Posted in Photos and tagged 1270, 1340, Central Station, dam, harbour, modern architecture, Rotte, Rotterdam, stop on August 29, 2014 by rura88.